I've read a lot lately about doctor assisted suicide, and depending upon your views on it, the pros and/or cons concerning it. At first read, this article I saw in the May 1, 2018 edition of the Calgary Sun, almost sounded like a twisted version of that. 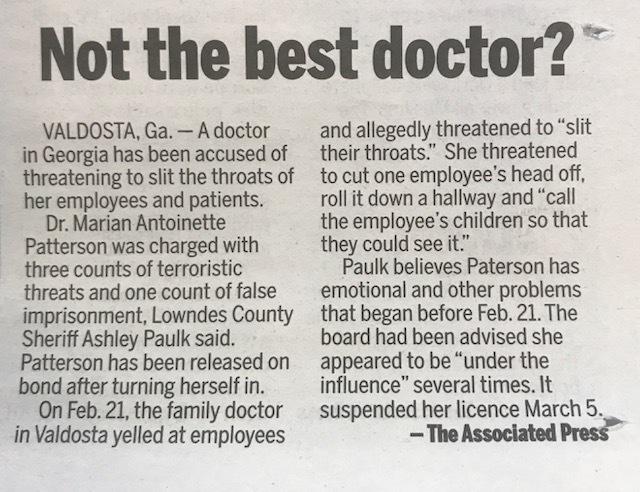 There's apparently a doctor in the state of Georgia, USA, that has offered to slit the throats and/or decapitate employees. Hmm; not your typical "Family Medicine" doctor, I think. There was no word as to whether or not this was a one-time offer for employees only, or whether patients were offered the same services. However, it appears that until this mess has been sorted out, the good doctor's licence has been suspended. Go figure! So if you're looking for a new family doctor, you might want to continue your search; this one appears to have ... "lost her head." Meanwhile, on the lighter side, did you hear the one about the urine sample? A young patient was handed a urine sample container and told to fill it up in the bathroom. A few moments later he returned with an empty cup. "I didn't need this after all," he said. 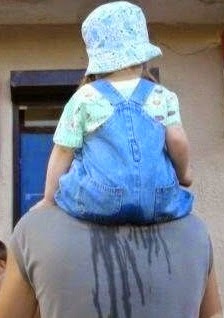 "There was a toilet in there."